A Hogan campaign official suggests that the Jealous endorsements from State House leaders have come too late. Montgomery County Executive Ike Leggett still has yet to pledge his support for the fellow Democrat. SUITLAND, Md. — Maryland’s governor’s race is heating up as August winds down. Democrat Ben Jealous got the endorsement from dozens of Annapolis lawmakers—including leadership in the State House — while Republican Gov. Larry Hogan announced he’s won the endorsement of the Maryland Fraternal Order of Police. 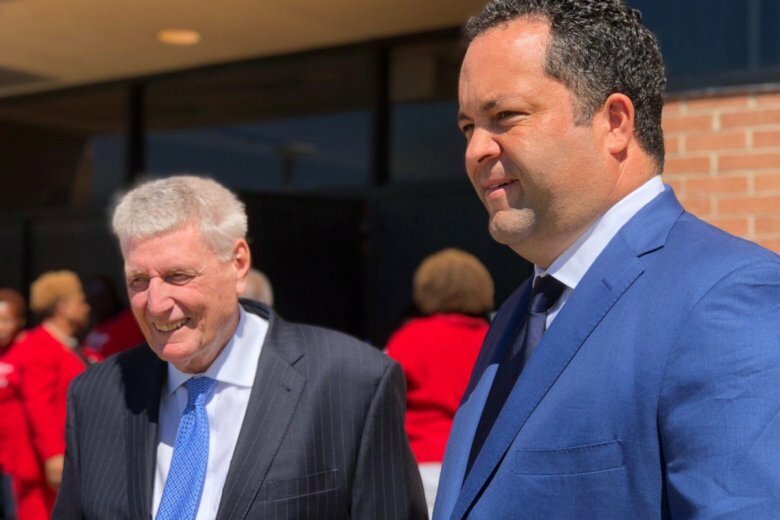 Outside of Suitland High School in Prince George’s County, dozens of Annapolis lawmakers, including Senate President Thomas “Michael” Miller and House Speaker Michael Busch, rallied around Jealous. With teachers holding up signs behind him, Jealous pledged to raise teacher salaries by 29 percent. A jump in pay is needed, he said, to attract and retain educators who otherwise can cross over into Montgomery County or D.C. for bigger paychecks. Among those supporting Jealous is his former opponent in the Democratic primary, state Sen. Richard Madaleno. “If you want a governor who’s going to go above and beyond for our young people — you have one choice to make in November — and that’s Ben Jealous,” declared Madaleno. Asked if the support coming now is, in fact, late in the campaign process, the House speaker said no. “The election won’t even start until September, when people start getting back to the workplace, or kids start getting back in school,” Busch said. Among those not yet endorsing Jealous: Montgomery County Executive Ike Leggett. Montgomery County is voter-rich territory. And Leggett, an African-American and a Democrat, serves one of the largest counties in the state. Leggett spokesman Patrick Lacefield said the county executive continues to have concerns about Jealous’ positions on school funding, taxes, and incentives for luring Amazon’s second headquarters.